This guidance is for sponsors applying for a variation to the Australian Register of Therapeutic Goods (ARTG) entry of a biological. Note that an ARTG entry is not limited to the information visible in the public ARTG entry. It also includes any supporting information provided with the dossier or subsequent variations that are held by TGA and were considered to be relevant to the initial decision. You need to request and receive our approval for any variations or changes to or in relation to the biological. This is to satisfy a condition imposed at the time of inclusion in the ARTG. You are breaching a condition of inclusion in the ARTG if you implement a variation before the Secretary has approved it. Penalties may apply (sections 32EF (criminal offences) and 32EG (civil penalties) of the Therapeutic Goods Act 1989). This restriction does not apply to notifications, where the proposed change may be introduced at the time of submitting the variation application to the TGA. If your change does not fit within one of these categories then it is likely that, under the legislation, you are not varying your entry in the ARTG. If you are unsure whether you need to make an application, contact the Biologicals Team. If you want to print all details, you need to Open all before you print. The questions below may help identify those changes 'that would have been relevant to the decision to include the biological in the ARTG'. These questions are not exhaustive and are the only indicators as to whether the change would have been relevant to the decision. Alter a critical in-process control or release specification? Have the potential to alter the justification used to support a critical in-process control or release specification? Justification can be by reference to limits set down in a standard, international guidance, process validation or from published literature. When information becomes available that alters the appropriateness of the justification, this could impact on the initial decision to accept the specification. Nullify or invalidate previous validation studies? A manufacturing process or method needs to be supported by current validation studies submitted and accepted by TGA. Re-validation should occur and data be submitted if the changed process or method is not supported by current studies. Alter a manufacturing process or test method, including changes to infectious disease test kits? Alter the key quality and safety parameters for a critical material? Key parameters are those that determine suitability for the intended purpose e.g. quality control specifications, sterility and biocompatibility. Introduce a new manufacturing site or change the scope of manufacturing steps performed at a current manufacturing site, which relate to that product? Generate a new Master Cell Bank or Working Cell Bank? Alter the formulation or composition of the finished product? Alter the approved risk-benefit profile? Alter the intended clinical use/therapeutic indication (including safety-related changes)? If the answer to any of these questions is, 'Yes', it is likely that the variation will have the potential to affect the quality, safety or efficacy of the product and will require submission to TGA and approval prior to implementation. For changes that require submission to TGA go to Step 3 of this guidance to determine the category of the change and if it requires evaluation or is 'self-assessable'. If the answer to all of these questions is, 'No', then it is possible that an application to vary your ARTG entry is not required. The exception is if the change could be considered a correction to your ARTG entry (Step 2, below). Your change could still impact compliance with Good Manufacturing Practice (GMP) requirements. It is a requirement of compliance with TGO 88 that epidemiological situations are monitored and that appropriate action is taken where quality or safety of the product could be impacted. TGA approves the process in place at facilities to perform this monitoring, review and potential action in response to epidemiological situations. As part of this approval process it is a requirement that TGA is notified where an interim donor deferral or manufacturing measure is put in place. Email this notification to bloodandtissues@tga.gov.au. Note that this is not considered a change that would have been relevant to the inclusion decision, so is not considered a variation to your entry. where an interim measure is assessed as needing to be implemented on a more permanent basis. In this case, we consider the issue to be no longer simply management of an epidemiological situation, because the situation is now permanent and requires a change to your donor selection criteria to achieve conformity to TGO 88, section 9(13). If you want to correct an ARTG entry that is incomplete or incorrect, you will need to apply to the TGA under subsection 9D(1) of the Therapeutic Goods Act 1989. Note that an ARTG entry is not limited to the information visible in the Register. It also includes any supporting information provided with the dossier or subsequent variations that are held by TGA and were considered to be relevant to the initial decision. There are spelling or grammatical errors in the information visible in the ARTG entry. The information visible in the ARTG entry is incorrect or absent. There are typographic errors in the Product Information or labels that need to be corrected to align with the ARTG entry details. You identify that a substantial error or omission of information was made in the information submitted previously in support of the inclusion of the biological. This does not include editorial and other future updates to documents. If editorial changes are made to information previously submitted in support of the inclusion of the biological. This is not a change to your ARTG entry. For example, corrections to a policy, standard operating procedure or validation report that do not change the intention or outcome. If the change is relevant to the decision to include your biological in the ARTG or any later decision to vary the ARTG entry. These are changes to your entry that require approval under 9D(3), as the change has the potential to impact on the quality, safety or efficacy of the biological. If your change would not have been relevant to the initial decision (Step 1), and is not a correction to your ARTG entry (Step 2), then it is likely that no application to vary your entry in the ARTG is required. Draft an application (Step 5. Start your application). Contact the Biologicals Team by email requesting a 'fee exemption code' for an application under subsection 9D(1) to correct an ARTG entry, making reference to the draft application number. Once a fee exemption code has been generated, the application form can be submitted. Prepare and submit a cover letter to support the change (Step 6. Prepare your cover letter). Other changes with the potential to impact quality, safety or efficacy. If you are making a change that creates a separate and distinct good (see regulation 11A, Therapeutic Goods Regulations 1990), you are not varying the entry for an existing biological, but creating a new one. Do not apply for a variation. If the therapeutic indication changes as a result of a safety-related variation, it will not be treated as a separate and distinct good. Do not apply for a variation under section 9D(3AA). Explain how your variation meets the criteria for a safety-related variation. Safety-related variations always require changes to the release documentation outlining warning statements e.g. Product Information. Where appropriate to support the changes, submit these as additional supporting documents. If the proposed change is more than adding a simple word or phrase to release documentation, or is intended to reflect new quantitative findings from a clinical trial or other type of study, the TGA is likely to need to evaluate supporting data. However, it is possible that safety-related changes can be considered 'self-assessable' and do not require evaluation of the supporting data. These may be identified on TGA screening of the application. The evaluation fee does not apply to self-assessable variations. Examples of safety-related requests for prescription medicines, including those that may not require evaluation of the supporting data are available. does not create a separate and distinct good. We may need to evaluate the supporting documents to make this decision. other ARTG entries of a similar kind have been varied for safety-related reasons. In this instance a response will be sought from you, which may result in the need to submit a safety-related variation. If your variation is not considered to be safety-related, it may still have the potential to impact quality, safety or efficacy. This section refers to changes that have the potential to affect the quality, safety or efficacy of the biological (under section 9D (3A) and 9D (3AC)), provided that the change does not create a separate and distinct good. The definitions for the main application categories of variations are provided below. Notifications Applies to specific variations made under section 9D (3AC) of the TG Act that have been determined to pose a very low risk when the defined conditions are met. These variations do not require evaluation of information and would be expected to have minimal effect on the quality, safety or efficacy of the biological. The changes can be implemented once the application (form, fee and supporting documents) have been submitted to the TGA. Self-assessable variations Applies to variations made under section 9D (3A) of the TG Act that do not require evaluation of information and would be expected to have minimal effect on the quality, safety or efficacy of the biological. The changes must be approved by the TGA before implementation. 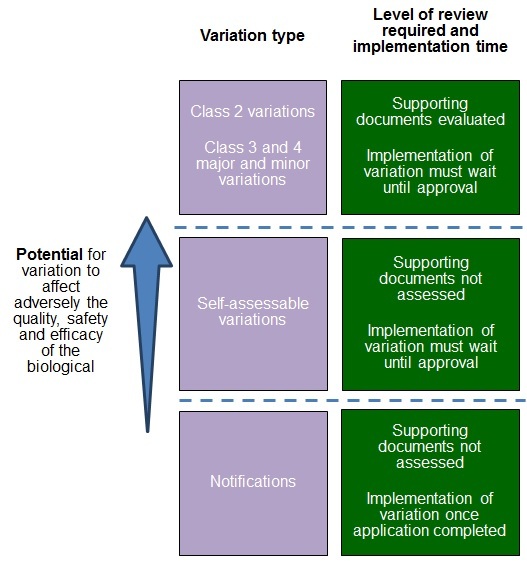 Minor variation Applies to a variation made under section 9D (3A) of the TG Act that requires the evaluation of quality and manufacturing information, other than a change that is a major variation for the biological or that would result in the biological becoming separate and distinct from other biologicals. The changes must be approved by the TGA before implementation. The changes must be approved by the TGA before implementation. The following sections provide guidance on the types of changes that do not require evaluation of the supporting documents (notifications, self-assessable variations). By default, if the change does not meet the definition of a notification or self-assessable variation then the change will be treated as a minor or major variation, as defined above. Notifications are types of variations that have been determined to pose a very low risk. The TGA has concluded that their implementation would not affect the established quality, safety and efficacy of an included biological. Notifications still require an application to the TGA, but do not require evaluation. all conditions that are relevant to that notification are met. As TGA experience with variations to ARTG entries for biologicals increases, we anticipate adding to the list of notifications. * Note that changes to some critical materials may have a more significant impact on the product than others and may require evaluation of the supporting data. For example, a change to the quality of a growth supplement (critical material) can have a significant effect on the culture conditions and would often require re-validation of the manufacturing process; a change to a primary container (critical material) may require re-validation of product stability. For some variations with the potential to impact the quality, safety or efficacy of the biological (including some safety-related variations), the supporting documents may not require evaluation. Applications that do not require evaluation of supporting documents are termed 'self-assessable' variations. all conditions that are relevant to that variation are met. As TGA experience with variations to ARTG entries for biologicals increases, we anticipate adding to the list of defined self-assessable variations. If your change is not listed in one of the tables of defined self-assessable variations, then you will need to assess the risk of the change adversely affecting the quality, safety or efficacy of the biological. You will need to submit this risk assessment with your variation request. The variation must have only a low potential to adversely affect the quality of the biological in order to not require evaluation of the data by the TGA. Note that if a subsequent review of the change identifies a greater potential to impact the quality safety or efficacy of the biological then it may require evaluation of the supporting data. If you are unsure on the application category or whether your supporting documents require evaluation, contact the Biologicals Team. Most variations require documents to be provided to support an application. Corrections to ARTG entries under subsection 9D(1) of the Therapeutic Goods Act 1989 may not require any supporting documentation. the potential to adversely affect the quality, safety or efficacy of the good. documents to support the variation e.g. validation data, operating procedures, literature references, updated specifications. The guidance provided in Step 3 (Determine the variation category) will help you determine whether the supporting documents require evaluation or not. some fields are locked, because they cannot be changed in a variation application. You can combine multiple variations to a biological or biologicals in a single ARTG entry within one application (except for safety-related changes), where they fit more than one category of variation. [cross] major variation or safety-related changes. Where a single application contains multiple variations in relation to biological in a single ARTG entry, the TGA will consider the acceptability of each of the variations individually. Self-assessable variations submitted in a single application with one or more variations that require evaluation cannot be approved and implemented until a decision is made for all variations in the application. As the TGA considers each variation on its merits, the non-approval of any of the variations within an application containing multiple changes would not result in rejection of the entire application. Where the TGA identifies questions with any of the variations, the decision on the application will be delayed until all issues have been resolved. For class 2 biologicals, you can apply to vary some or all products contained within a single ARTG entry. This does not apply to class 3 and 4 biologicals as there is only a single product included under each ARTG entry. One application must be made for each ARTG entry. Where you are introducing the same variation to separate entries on the ARTG, an application is required for each ARTG entry, but we may evaluate them at the same time. active ingredient, for Class 3 or Class 4.
you explain how the applications are similar. Reduction or waiver of the evaluation fees may apply to simultaneous submissions and abridged applications. Note that at this time there can only be one application under review for a specific ARTG entry at a time. For all variations to a biological included in the ARTG, you must submit an application via TGA Business Services. For information on accessing and completing the form, see the Biologicals application form - a step-by-step guide. This step applies to requests for all variations. Follow our general dossier requirements for all submitted supporting information. the proposed change/s, such as a marked up copy of a document. If you refer to previously submitted documents, provide sufficient details for us to be able to locate the documents easily. if you are including supporting documents, provide a list of these. a list of the supporting documents being provided. If third party documents are provided directly to TGA to support the change, you also need to provide a letter from the relevant third party stating that you have the authority to rely on them as supporting information. a list of the supporting documents provided. explain how the applications are similar, and indicate whether a reduction or waiver of the evaluation fee is being sought. Most variations require documents to be provided to support an application. the potential to impact adversely on the quality, safety and efficacy of the good. Corrections to ARTG entries may not require any supporting documentation. There is no application or evaluation fee for making corrections to an ARTG entry for a biological under subsection 9D(1). The use of the fee exemption code in the application form prevents invoicing for the application fee. For all other applications, you need to pay the application fee at the time the application is submitted. Following submission, the acknowledgement of successful submission invites you to print a copy of your invoice. We will not consider your application until you have paid your application fee. Screening is not performed on notifications. Once the application, fee and supporting data have been received they will be processed (Step 11). Note that where we do not agree with the variation category you have assigned for a change to be a self-assessable request, we will inform you that the change does require evaluation and provide you with a justification. the anticipated TGA timeframe for evaluation and decision. We aim to accomplish the screening of most applications in 15 working days. Our legislated timeframe is 30 days for notification of whether we will evaluate the application (regulation 16GB, Therapeutic Goods Regulations 1990). No timeframe is set for corrections to ARTG entries [applications under section 9D(1)]. An additional fee applies to the application if the supporting documents require evaluation. Standard evaluation fees are defined in the Schedule of fees and charges. if the Secretary has information relating to the goods that enables the evaluation procedure to be abridged (abridged application). Following screening of your application, if evaluation of the supporting information is required you will be sent an invoice for an evaluation fee. We will evaluate most applications within the TGA target timeframes below. The letter we send you at the end of the screening will state the anticipated TGA timeframe for evaluating your application. When you have applied for multiple variations that fit more than one category, the applicable timeframes will reflect the highest level of category change. For example, if you have applied for one or more self-assessable variation and one minor variation, the timeframes will be those of the minor variation. you will be advised of a longer timeframe for evaluation of your application in the letter we send to you following screening. We may ask you for more information under section 32JA of the Therapeutic Goods Act 1989. It is an offence not to comply with such a notice or to provide information that is false or misleading in a material particular. We must allow you at least 14 days from when you receive the notice, to provide the information and documents. The response period will be clearly stipulated in the section 32JA letter. If we have not given you sufficient time to respond, you may ask us for an extension in writing by contacting the Biologicals Team. The period of time from when we send a request under section 32JA to when you respond, does not count towards TGA working days. For notifications, the approval letter will be sent out to you within a few working days of receiving your application and supporting data and the fee being paid. For other variations, once we have made our decision, we will send you a decision letter. We make our decisions on all the applications within a simultaneous submission at the same time. Read the decision letter carefully, especially the list of changes approved and the timeframe for implementation. If you have applied for more than one variation in an application, it is possible that we may approve some of the variations and not others. As part of the approval the Secretary may consider whether additional conditions need to be imposed under section 32EE of the Act. information on your rights to seek a review of the decision. Wait for approval before implementing a change. You are breaching a condition of inclusion in the ARTG if you implement a variation before the Secretary has approved it. If a variation results in improved quality or safety, we may also impose a new condition of inclusion under section 32EE with a timeframe for implementing the change. On rare occasions, some changes beyond your control may take place before the TGA can approve them (for example, a change to a test kit used by a contracted facility). In these cases, it is your responsibility to submit a request to the TGA as soon as you become aware of the change.